152 pitches over the last two days, and 247 pitches over the last six days. 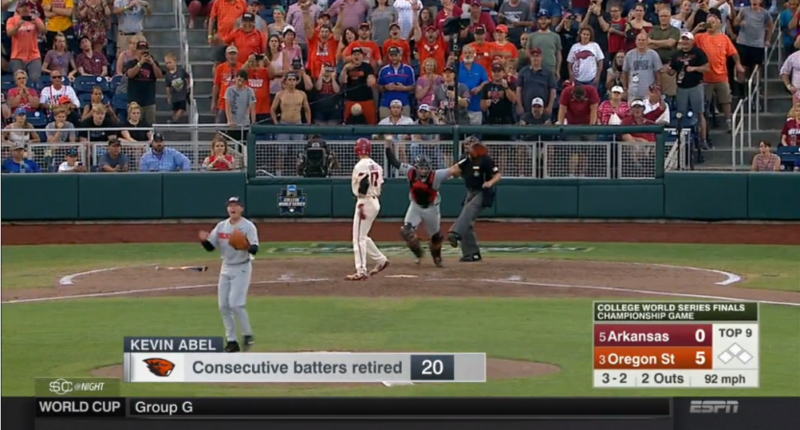 The Oregon State Beavers shut out the Arkansas Razorbacks 5-0 on Thursday night in Omaha to win their third College World Series title (and their third since 2006). The star of the championship-clinching game for Oregon State was without question pitcher Kevin Abel. The freshman threw a complete game, two-hit shutout, with 10 strikeouts. He retired 20 straight batters to finish the game. All that’s great, and you can understand why Oregon State head coach Pat Casey wanted to leave the Beavers’ title chances in the star freshman’s hands. However, Abel’s usage in the tournament was extreme, and frankly abusive. Abel threw 129 pitches on Thursday night, after throwing 23 pitches in a relief appearance on Wednesday. So that’s 152 pitches over the last two days, and he threw 95 pitches in Oregon State’s CWS game against Mississippi State on Saturday, making for 247 pitches over a six-day span. Freshman RHP Kevin Abel threw a 129-pitch, two-hit shutout to win the national title for @BeaverBaseball. He's threw 152 pitches in the final two games, 247 in the last six days and 305 total in the CWS over an 11-day span. Yes, we’re talking a national championship and the opportunity of a lifetime. And obviously Abel is going to say he can keep going; he wants to be a hero and is a competitor. In this situation, it’s 100% up to the head coach to make the call. Abel was rolling and seemed to give them the best chance to win, so understandably Casey preferred to not take him out. But you have to keep in mind this kid’s long term baseball career as well, and not just make these decisions based on what appears to give the team the best chance to win. We’re generally more protective of pitchers these days than ever before, for good reason- we constantly see them getting injured and a lot of it is the toll on their bodies from throwing so many pitches before they even reach professional baseball. And even if Abel doesn’t suffer injury or reduced performance from this wear and tear, MLB organizations are very aware of the pitches and innings he’s thrown. He can stay healthy and his draft stock could drop in a couple years just because organizations are concerned about the workload. Now, Abel doesn’t care about any of that right now, and will celebrate his championship and one of the greatest pitching performances in CWS history. And odds are these pitches thrown aren’t the difference between him having a long term health issue or not. But it’s greatly putting him at risk and is another of *many* examples of college baseball coaches abusing pitchers — and potentially hurting the pitcher’s professional baseball, career chances — to win a game. It’s a huge problem (as ESPN’s Keith Law frequently reminds), and it doesn’t appear it’s going to stop anytime soon.